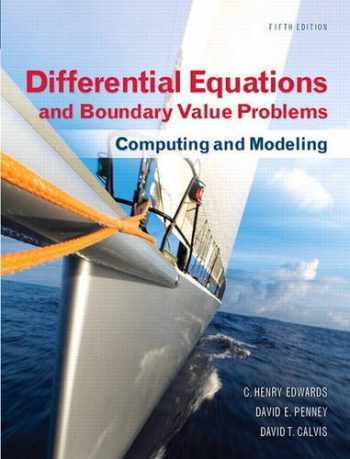 Acknowledged author C. Henry Edwards wrote Differential Equations and Boundary Value Problems: Computing and Modeling (5th Edition) (Edwards/Penney/Calvis Differential Equations) comprising 792 pages back in 2014. Textbook and etextbook are published under ISBN 0321796985 and 9780321796981. Since then Differential Equations and Boundary Value Problems: Computing and Modeling (5th Edition) (Edwards/Penney/Calvis Differential Equations) textbook received total rating of 4 stars and was available to sell back to BooksRun online for the top buyback price of $64.57 or rent at the marketplace. For introductory courses in Differential Equations. This best-selling text by these well-known authors blends the traditional algebra problem solving skills with the conceptual development and geometric visualization of a modern differential equations course that is essential to science and engineering students. It reflects the new qualitative approach that is altering the learning of elementary differential equations, including the wide availability of scientific computing environments like Maple, Mathematica, and MATLAB. Its focus balances the traditional manual methods with the new computer-based methods that illuminate qualitative phenomena and make accessible a wider range of more realistic applications. Seldom-used topics have been trimmed and new topics added: it starts and ends with discussions of mathematical modeling of real-world phenomena, evident in figures, examples, problems, and applications throughout the text.